Saint Joseph's Oratory Museum, located in the heart of the Basilica, is principally dedicated to sacred art. It offers a treasure of religious, historical and artistic heritage from Quebec and abroad. The Oratory owns an impressive collection of art work related to the life of the Holy Family and Saint Joseph. The museum will present Joseph, the father of Jesus, as an important saint in Montréal. This year the city is celebrating its 375 Anniversary. The permanent exhibit : the Oratory's Nativity Scenes — Its collection of creches forged the Museum's reputation. Around 200 works from Quebec and from over 100 countries make up the permanent exhibit. 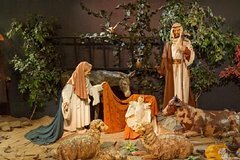 Dioramas of Saint Joseph's life : created in 1955 by Montreal Sculptor Joseph Guardo, these life-size dioramas, representing scenes of Saint Joseph's earthly life, continue to captivate all visitors big and small.